The destination that morning was the Cossatot River State Park and Natural Area. The Cossatot River is well known for its scenery and challenges to floaters, canoeists, and kayakers alike. I was anxious to be there, but as I drove by a pasture in a valley along US Highway 71, I saw this scene. Fortunately, there was enough shoulder on the road that I could park the car safely, get my camera and trusty old Minolta 70-210 lens, and look for a vantage point to create a photograph that captured some of the magic of the moment. I shot verticals; I shot horizontals. I moved up and down the road; I moved closer. 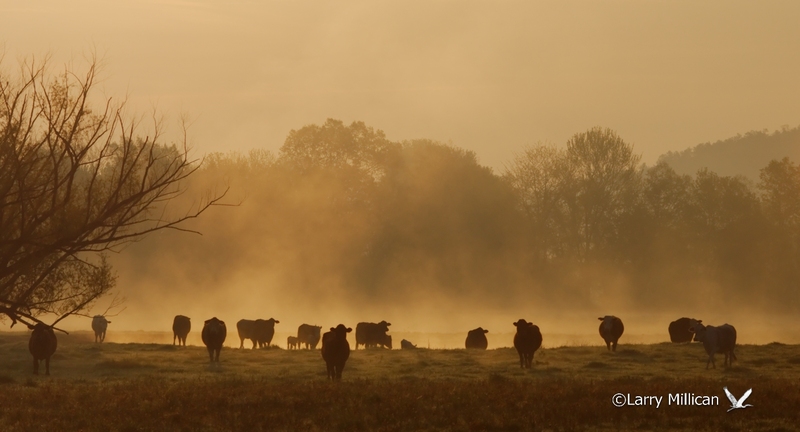 I set exposure, with the idea of showing the light in the fog, and letting the cows become shadowy silhouettes. The image shown here is actually a horizontal crop from one of the verticals shot. This entry was posted in Arkansas, Nature, Photography, Travel, Uncategorized and tagged A77, Arkansas, Cossatot River, Minolta, nature, outdoors, photography, Silhouette, Sony, travel. Bookmark the permalink.